Action on the sidelines? 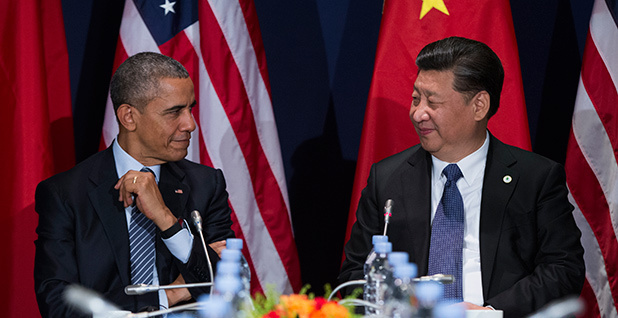 President Obama and Chinese President Xi Jinping have a semi-private conversation at the Paris climate change talks. As junior ministers begin the heavy lifting of negotiating a final agreement, the two leaders look two weeks ahead to potential outcomes. Photo by Evan Vucci, courtesy of AP Images. LE BOURGET, France -- The United States and China appear joined at the hip during U.N. global warming negotiations here, at least on the surface. President Obama's first official climate meeting yesterday was with Chinese President Xi Jinping. The leaders of the world's two largest greenhouse-gas-emitting nations touted two previous joint emissions deals, gave nearly back-to-back speeches on the urgency of tackling the climate threat and together issued a statement of support for an ambitious global accord. Even their pavilions, shiny public relations booths where countries show off their clean energy work, stand practically side by side. They are separated, fittingly, by that of Mexico -- a country with a reputation at the climate talks for building bridges between developed and developing nations. "I think there is no climate solution without the biggest emitters working together," said Li Shou of Greenpeace China. "The question is how strong the alignment between the U.S. and China gets reflected in a broad agreement among 190 nations," said Elliot Diringer, executive vice president of the Center for Climate and Energy Solutions. "They don't see eye to eye on every issue, so there's still things that need to be worked out between them," he added. Some of the concern comes from the political whiplash many U.S. officials said they felt at last year's U.N. talks in Lima, Peru. Though it was held just a month after the announcement of a much-heralded agreement between the two countries, China took as hard a line as ever during the actual negotiations. One diplomat described China as "playing both sides of the street." They have now struck two major climate agreements. The first was a joint announcement in November 2014 of their respective climate targets: America's to cut emissions 26 to 28 percent below 2005 levels by 2025, and China's to peak emissions by 2030. Nearly a year later, Xi announced in Washington, D.C., that China would best America's $3 billion pledge to help poor countries deal with climate change by an extra $100,000 while launching the world's largest carbon market. "The fact is that China has taken an undisputed leadership role," U.N. climate chief Christiana Figueres said during a recent talk in Washington, adding, "Who would have been able to tell us that China would have been able to accept or even propose a peaking of coal?" "Nowhere has our coordination been more necessary or more fruitful" than on climate change, Obama said after the meeting. "There are differences between our countries. That's natural," he added, citing cybersecurity and maritime issues. But, he said, "there's far more that the United States and China have in common than separates us, and ... when we work together, good things happen." Yet differences remain on climate change as well, some of which were reflected in Obama's and Xi's respective speeches. Obama, for example, homed in on holding countries accountable for keeping their mitigation pledges. Xi held firm on the need for finance and the right of growing countries to pollute, saying, "Addressing climate change should not deny the legitimate needs of developing countries to reduce poverty." "I would expect China to not lean forward very publicly because they need to stay aligned with the G-77 [group of developing countries]. But at the end of the day, they'll use their influence to bring others along," said one longtime observer of the U.N. talks. Duncan Marsh, director of the international climate program at the Nature Conservancy, said both leaders' speeches were made not only to the world leaders assembled at the U.N. conference but also to their home audiences. Still, he said, "one can feel the room for convergence between them. It's clear that the U.S. and China have a mutual interest in getting a deal in Paris."